This is based on my own personal experience since I’ve been thinking about getting an exercise equipment for home exercise. Due to pre-existing knee condition, it is not that suitable for me to go jogging- but walks in the park does not provide enough cardio intensity (but still better than nothing). I have been going around to shop around for an affordable exercise equipment- more of the cross trainer or elliptical machine. Those sold in Fitness Concept is too expensive (above RM3000 each) and when I try it on, it gives the knee pain just like what I used to have in the gym (each of our body structure design is different, our body may not be suited for all machine type- that’s why you need to try it yourself to see). 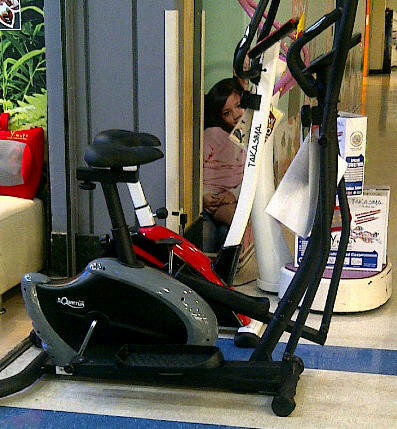 Subsequently I was interested earlier on to get the cross trainer from Gintell which that time was sold for RM1688. It has Easy Payment Plan with most of the banks- that means you can pay back in installment. Anyway, due to objections and o my work schedule I did not have time to go back and follow up with the store. When I tested on the machine, it goes easy on the knees and immediately I can feel the heart and my quadricep muscles working. Exercise machine is built to take into account the body’s kinetic movements- and unlike usual activities of daily living, its range of motion goes easy on certain angle, hence minimizing injuries compared to sports or jogging. It is also less impact to the knees than jumping jacks and running on the spot. It seems that this version was only released about 2 weeks ago and therefore the brochures are not available yet on this product. The promotion price is RM1800 till 14 April 2012…whereby it will revert back to its normal sale price of RM2300. And they offer a RM100 voucher if purchase now. In the past when I go to the gym, so long as I am already physically there, I have no problem starting to exercise. My reason to go to gym is to workout and exercise, not for socialising. The workouts are consistent- I have my own target calories to burn and once I achieve that, I would do a couple of core exercises with the medicine ball, warm down and head on home. So without the gym, and with the stressed day of work, my mind cannot plan and execute exercise such as 5 min of jumping jacks, sit ups, etc. I would just like to sit on a machine and just cycle or cross train till I achieve what I wanted to achieve. That system had worked so far when I was in the gym for a few years. If you are like me, then an exercise equipment may be suitable for you. On the other hand, I know some people naturally love cardio exercise- they love jogging in the park and followed up push ups and sit-ups. My friend’s husband is a good example- almost every day he works out in the park till his shirt is drenched wet. It helps him to destress after a stressful day at the office. For this group, they don’t need any exercise equipment or machines because they have within them the motivation to exercise. b. Every month you pay for installment- but the difference is that, in the end, you get to keep the machine. If you join the gym, you would need to pay a fixed amount regardless of whether you make use of the facilities or not. If you don’t utilize, the money’s ‘burned’. Once you stop going, you get nothing- and the weight would start creeping back in. Whereas many of the fitness equipment sold outside comes with easy payment plan- take now, pay later. Each month, you still pay the installments and in the end of the tenor, the machine’s yours. What happens if the machine gets spoilt? The reason why people go for the gym is because they get to use the expensive equipment (gym machines are higher range as they need to be more durable due to heavy use). But if you are buying for your own home workout, look for the company that offers good warranty. The reason why I am considering Takashima is because the sales officer mentioned it is lifetime service- ie anytime it is spoilt, we can get someone to come over to fix it…. you only need to pay for the spare parts. What happens if I got bored and stop using it? Well, about worrying the machine becoming a white elephant, think of it this way. Let’s say you buy the machine at RM1800 and pay installment for RM150 a month under Easy Payment Plan. By 6 months, you would be able to tell for sure if it is the machine for you. Let’s say you get sick of it and know it is not for you, you can always ask around amongst friends and relatives on who is interested to buy your machine. By 6 months, you would have paid RM900. Even if you sell the machine for about RM1200 or RM1500, I am sure there would be fitness wannabees who would snap it up from you- but you need to make sure it is still in good condition. I know I would if I get offer for the equipment discount from someone I know. So you still get to recoup your “losses” which is still much cheaper than the write off from gym membership fees that you cannot recover back. You would have only spent about RM600 to ‘test’ if the machine is for you- and it is still cheaper than a gym membership (I don’t think any commercial gyms can cause cheaper than RM150 without tying you down for years). On the other hand, if the machine’s for you, and you get into the groove of using it when you are watching TV, reading book, playing with the Farmville via Smartphone while cycling (that’s what we call multitasking  ), you are bound to feel better and fitter and lose weight. It’s a gamble but from what I see, the stakes are not high. This reminded me on what I felt when I signed up for gym membership years ago (that time we do not have affordable gym equipment with reasonable quality). I told myself I am taking a gamble- if it works out, I will feel better and fitter. If it does not, I can always quit once my contract is up. I ended up staying with the gym for a few years. Perhaps, before making any big decisions, ask yourself, what’s the worst that can happen? What have you got to lose? And ask yourself if you are willing to pay the price in possible exchange for something more valuable- in this case, your health. So, find an exercise program that suits you and embark to your journey of self discovery about your new fitter and healthier self. Regardless of what you buy, I think you have to consider not only the quality of the exercise machine, but also the mileage you will get out of it. There’s no use to buy a machine you are not planning to use, cheap or expensive. Very good sharing. I’m also considering on the Takashima 2-in-1 machine. Will go and try out in the outlet.